The Jetsons made us all believe that flying cars were the future of commuting, and in truth we’ve had the technology to create flying cars for quite some time now. They haven’t taken off, so to speak, for a number of reasons – most notably that air traffic control capabilities might be overwhelmed by a large number of personal aircraft flying around. With computerized air traffic control taking over, flying car ideas are again gaining traction. This design is known simply as the YEE. 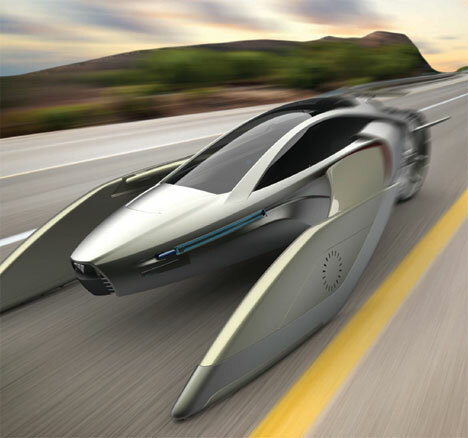 It’s meant to be a futuristic mode of transportation that embodies the best of the flying car ideal. 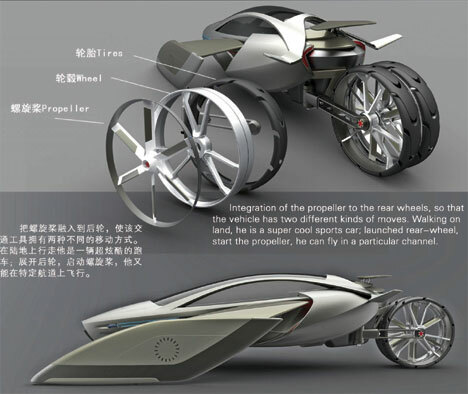 Designed by Pan Jiazhi, Zhu Wenxi and Lai Zexin, the concept car took the gold medal for Best Creative Future in the 2010 International Concept Car Design Contest. The YEE is geared toward single people or small families living in the suburbs who may face an unpleasant commute every morning. The vehicle would be able to get them to their destination quickly and pleasantly while avoiding the downtown traffic. But the car could be used for running errands around the neighborhood as well, because in its road mode it operates just like a regular car. When it’s ready to fly, the back wheels actually extend to become rear propellers. 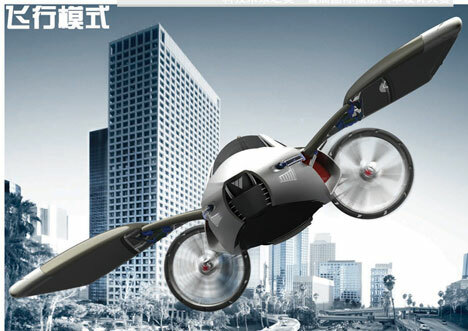 The project information doesn’t mention how the transition from road vehicle to air vehicle is handled; the wings and propellers are used to propel and stabilize the vehicle when it’s driving on the road, so extending them before takeoff wouldn’t be possible. Of course, the design is only a concept at this point so it’s not worth tearing apart every one of its aspects. If the YEE ever goes into production those questions will have to be answered, but for now it’s an interesting and fun bit of futuristic car eye candy.